At the top of the cannibal movie tree are the likes of such infamous films as Cannibal Holocaust, Cannibal Ferox, Mountain of the Cannibal God and Emanuelle and the Last Cannibals. A pair of lesser known cannibal flicks, 1988's The Green Inferno: Cannibal Holocaust 2 and 1981's Cannibal Terror, arrive on blu-ray this March courtesy of cult distributor 88 Films. Despite its title, The Green Inferno: Cannibal Holocaust 2 isn't an official sequel to Ruggero Deodato's notorious 1980 shocker. Directed by Antonio Climati, The Green Inferno (which takes its name from the film within Deodato's film and shouldn't be confused with Eli Roth's recent atrocity) was the last gasp of the cannibal movement, and satirises many of the tropes of the genre. Special features include a 2K remastered version of the film; English and Italian language tracks; a remastered trailer; selected scenes from cannibal doc Banned Alive: The Rise and Fall of Italian Cannibal Movies. A group of enterprising adventurers venture into the Amazon jungle in search of a missing professor but soon the youngsters encounter more than they bargained for – European colonialism is exploiting the rainforest and the natives are fighting back! While Deodato's original critiqued the mondo pseudo-documentary phenomenon, here director Antonio Climati (Mondo Cane, Savage Man, Savage Beast) turns the focus to satirising the hypocrisy and complexity of Cannibal Holocaust itself. A potent mix of macabre imagery, scenic locations, extreme gore and sly in-jokes, The Green Inferno is the gut-munching sequel you always knew you wanted but were too afraid to ask for! Cannibal Terror is that rarity - a French cannibal film! Director Alain Deruelle's movie found itself on the UK Video Nasties list upon its VHS release, despite it being more laughable than revolting, thanks to its non-existent budget and amateur cast. Special features include a limited edition slipcase on the first print run only; a booklet with writing by genre historian Calum Waddell; a deleted scene; trailer; That's Not The Amazon! - The Strange Story of the Eurocine Cannibal Film Cycle. 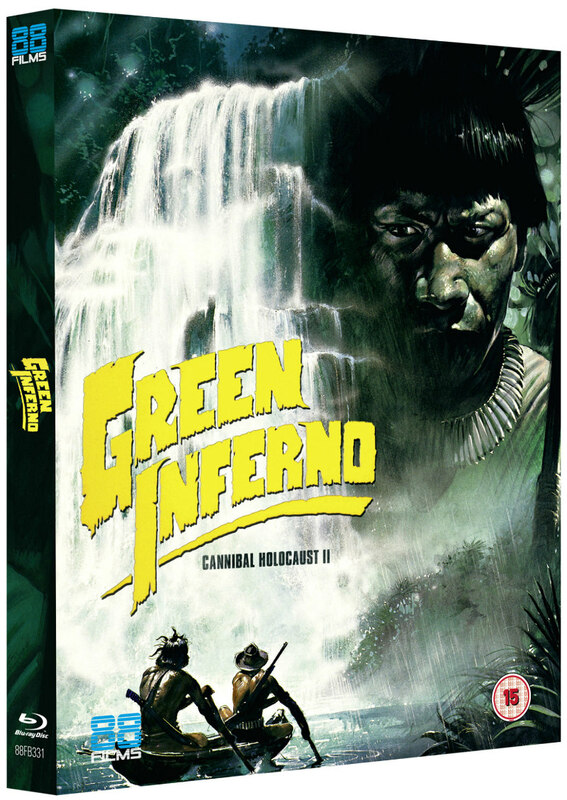 88 Films presents The Green Inferno: Cannibal Holocaust 2 and Cannibal Terror on Blu-ray 11th March 2019.